This is a great time of year to see top-flight stage productions around the area. There is a wide variety of shows on the calendar right now – a performance of an opera based on a Shakespeare story, an American premiere of a play by a playwright from Great Britain, a musical theater piece geared for young girls, an award-winning musical based on an award-winning play, a dinner theater production of a timeless classic musical and the final weekend of Philly Theatre Week. The performance of an opera based on a Shakespeare story is Opera Philadelphia’s production of Benjamin Britten’s “A Midsummer Night’s Dream.” Performances are scheduled for February 15 and 17 at the Academy of Music (Broad and Locust streets, Philadelphia, 215-731-3333, www.operaphila.org). “A Midsummer Night’s Dream, Op. 64” is an opera with music by Benjamin Britten and set to a libretto adapted by the composer and Peter Pears from William Shakespeare’s play, “A Midsummer Night’s Dream.” It premiered in 1960 at the Aldeburgh Festival, where it was conducted by the composer and with set and costume designs by Carl Toms. 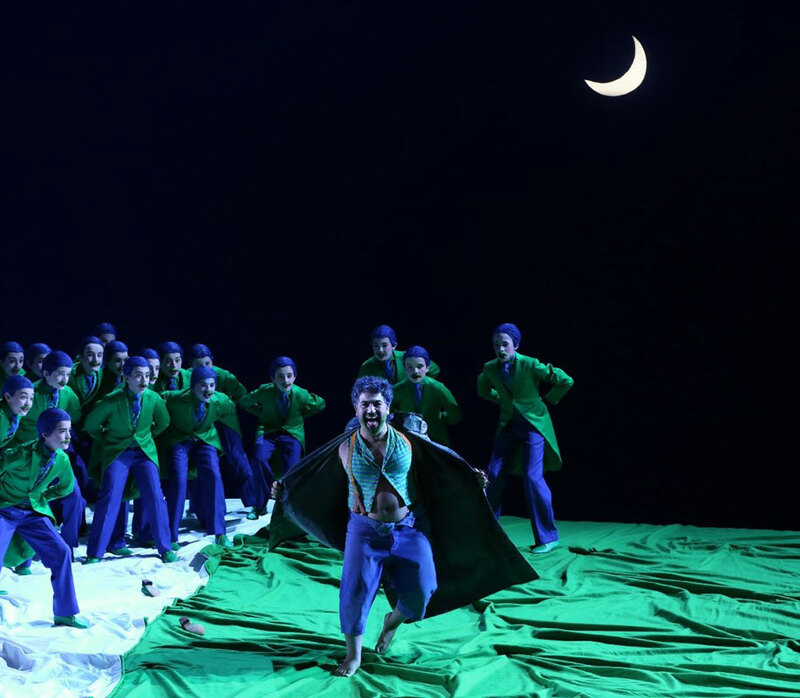 The Opera Philadelphia production marks the long-awaited first American presentation of Robert Carsen’s classic staging of the opera, which has been touring the world for more than a quarter of a century. The revival will be directed by Emmanuelle Bastet, Carsen’s collaborator for the past two decades. As in Europe, the production features Michael Levine’s original set and costume design with lighting by Robert Carsen and Peter Van Praet and the choreography of Matthew Bourne. Benjamin Britten’s “A Midsummer Night’s Dream,” which is led by Music Director Corrado Rovaris, features British countertenor Tim Mead, American soprano Anna Christy, and “Game of Thrones” alum/English actor Miltos Yerolemou. Grammy Award-winning tenor Brenton Ryan sings opposite soprano Georgia Jarman. Rounding out the quartet of lovers are German-American mezzo-soprano Siena Licht Mille and American baritone Johnathan McCullough. “Britten does an amazing job of setting the text so that the music really complements what’s going on with the drama,” said McCulllough, during a phone interview last weekend from his home in Philadelphia. McCulllough received a Bachelor of Music degree, Master of Music in Opera degree and Artist Diploma, all from the Curtis Institute of Music in Philadelphia. He is a native of Sherman Oaks, California. “There are 15 principal roles in this production which is quite a lot for an opera,” said McCullough, who is a recipient of the Partners for the Arts First Prize in the Promising Young Artist Category, second place in the Mario Lanza Voice Competition, the Bel canto vocal scholarship, a 2013 Career Bridges grant and a 2012 George London Foundation Encouragement Award. 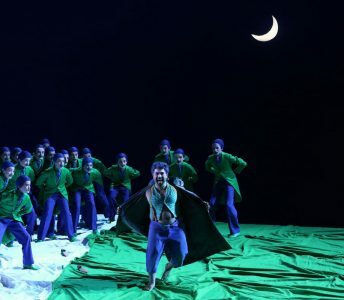 English National Opera’s production of 2011, directed by Christopher Alden, set the opera in a mid-20th-century school, with Oberon (Iestyn Davies) and Tytania (Anna Christy) as teachers and Puck and the fairies as schoolboys. Oberon’s relationship with Puck is given overtly sexual overtones, and Puck responds with alternate anger and despair to Oberon’s new-found interest in Tytania’s Changeling boy. The silent older man who stalks the action in the first two acts is revealed to be Theseus. “The plot is great, and the music is great,” said McCullough, whose Sherman Oaks alma mater Notre Dame High has star-studded list of alumni. The list of ND grads includes Rami Malek, Kirsten Dunst, Nick Cassavetes, Jane’s Addiction’s Dave Navarro and Stephen Perkins, Jerry Mathers (Beaver from “Leave It to Beaver”), Staci Keenan and a number of pro sports luminaries such as MLB’s 2017 MVP Giancarlo Stanton. Video link for Opera Philadelphia’s production of Benjamin Britten’s “A Midsummer Night’s Dream” — https://youtu.be/-tptCEeK7FU. Performances are scheduled for February 15 at 8 p.m. and February 17 at 2:30 p.m. Ticket prices range from $25-$299. 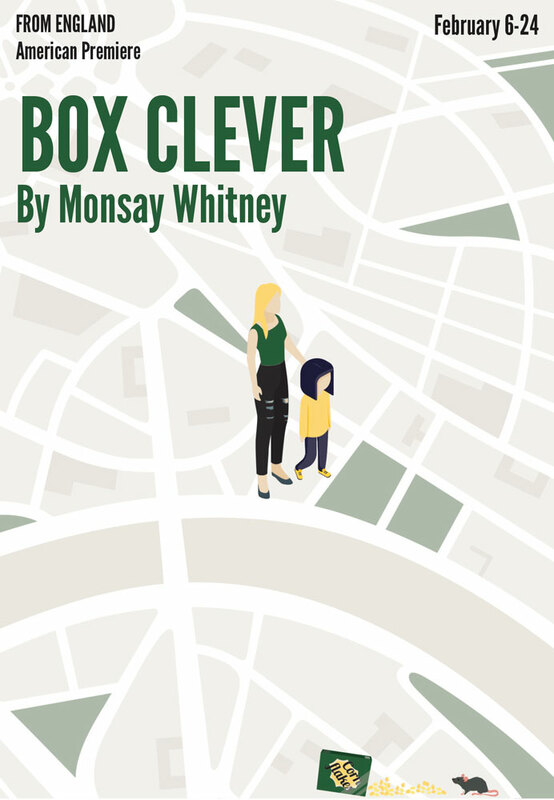 The American premiere of a play by a playwright from Great Britain’s is Inis Nua Theatre production of “Box Clever” by English playwright Monsay Whitney. The show, which is directed by Inis Nua Theatre’s Artistic Director Tom Reing, is running now through February 24 at the Louis Bluver Theatre at the Drake (302 South Hicks Street, Philadelphia, https://inisnuatheatre.org). “I first saw ‘Box Clever’ in Scotland,” said Reing, during a phone interview Wednesday afternoon. “I saw it when it premiered at the Edinburgh Festival Fringe in August 2017. Playwright Monsay Whitney is an actress and playwright living in London with her daughter. Her writing career began with the Lyric Young Writers class, and her play Hand to Mouth was developed and shown at the Lyric Hammersmith and chosen by Simon Stephens as Theatre 503’s “Playwright Presents” scheme. “Box Clever” is her third play — and her first to have a full run. 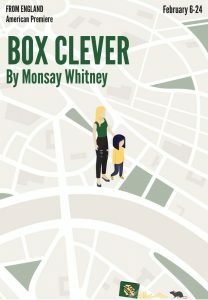 “Box Clever” may be a two-handed play but it still has a lot of depth, plenty of characters and an interesting story. In a women’s shelter in London, headstrong, mouthy and maybe a little crazy Marnie struggles to take care of her four-year-old daughter in a moving and relevant dark comedy. Marnie’s three useless ex-boyfriends can’t seem to leave her alone. There’s Danny, the father of her daughter. There’s Liam, a junkie who keeps leaving her voicemails. And there’s Stevie, who she calls “an angel” but who calls her a stalker. Add to the mix Fi Fi — her so-called feminist social worker who follows her around constantly “like a roving mosquito handpicking an arse cheek” and Marnie’s struggle to keep her head above water is just starting. She wants to protect the place she’s secured for herself and her daughter at a women’s home, but it’s an uphill battle full of twists and setbacks that she can’t always control. Reing draws on his experiences working at Catholic charity group homes to stage the play. “Before I became Artistic Director here, I was Education Director at InterAct Theatre Company,” said Reing. “We did residencies in group homes for mothers and their babies. “We used theater to teach education and to create empathy between mothers and their babies. A lot of them are coming from a history of abuse and their skills are limited. The women were trying to gain independent living for themselves and their children but there were always things stacked up against them. The current safety net is not enough. The edgy two-hander stars Inis Nua Theatre newcomer Ruby Wolf as Marnie, and Inis alumna Rachel Brodeur playing all other roles. “Box Clever” will run through February 24 at the Louis Bluver Theatre at the Drake, 302 South Hicks Street. Tickets are $25 and $35. Reservations can be made by calling (215) 454-9776 or visiting inisnuatheatre.org. 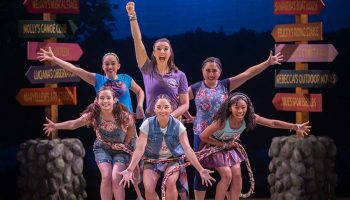 From February 14-17, the Kimmel Center (Broad and Spruce streets, Philadelphia, 215-731-3333, www.kimmelcenter.org), is presenting “American Girl Live” in the Perelman Theater as part of its Family Discovery Series. “American Girl Live” is a Mills Entertainment stage production, featuring all-original songs and unforgettable experiences – including a sleepover camp with some new friends for an exciting summer away from home. As bold tales of bravery and friendship come to life, iconic American Girl characters lend a hand through story and song. In “American Girl Live,’ a new, original, 90-minute musical that celebrates the power of girls and strength of friendship, audiences join five spunky campers and their fearless counselor at Camp American Girl, an overnight camp in the North Woods. Overcoming fears and obstacles along the way to having the summer of their lives, these brave campers rely on wisdom and advice delivered by Rebecca, Maryellen, Julie, Nanea, Luciana, and Melody – the beloved American Girl dolls they’ve brought along to camp – who inspire audiences in surprising and delightful musical numbers, each reflecting their historical eras. Empowered by the stories and conviction of their American Girls, the campers learn that they can overcome anything and achieve their dreams, so long as they stay true to themselves and support one another. The show’s director is Gina Rattan, who is also the director of the currently running National Tour of “Rodgers and Hammerstein’s Cinderella” and thechoreographer is Emilie Renier, who has choreographed and performed in productions both nationally and internationally. “I joined the team last August,” said Renier, during a phone interview last week from Loveland, Colorado. “I worked with Gina on the National Tour of ‘Rodgers and Hammerstein’s Cinderella’ as assistant choreographer. “With American Girl, they used to have a musical that was performed in American Girl’s New York store,” said Renier. “They talked to people at Mills Entertainment – talked about a new musical with the American Girl brand. They wanted a show where the American Girls come to life. “In this show, five girls go to camp with their American Girl dolls. They face obstacles at camp and the dolls, who are there in doll form, transform into live girls. The show is aimed at pre-teen girls – and has the ability to deal with that age group’s somewhat limited attention span. “It’s a 90-minute show in two acts,” said Renier. “It’s fast-moving and has a lot of interesting music. The audience never gets bored.” Video link for “American Girl Live” — https://youtu.be/r5QRb5gcdTM. “American Girl Live” performances are scheduled for February 14 and 15 at 7 p.m. and February 16 and 17 at 11 a.m., 2 and 7 p.m.
Now through March 3, “The Bridges at Madison County” will be performed by Philadelphia Theatre Company at the Suzanne Roberts Theatre (480 South Broad Street, Philadelphia, philadelphiatheatrecompany.org). The show is based on the 1992 best-selling novel by Robert James Waller. In 1995, the book was adapted into an Academy Award and Golden Globe-nominated movie directed by Clint Eastwood, starring Meryl Streep and Robert Redford. In 2014, the team of multiple TONY Award winner Jason Robert Brown (The Last Five Years, Parade, Songs for a New World) and Pulitzer Prize and TONY Award winner Marsha Norman (‘Night Mother, The Color Purple) brought the story to the stage. The show went on to win two Drama Desk Awards for Music and Orchestration and two TONY Awards for Best Original Score and Best Orchestrations. The show in Philadelphia is directed by Mark Martino. Francesca Johnson, a beautiful Italian woman who married an American soldier to flee war-ravaged Italy, is looking forward to a rare weekend alone on her Iowa farm while her family heads to the 1965 State Fair. Soon after they depart, ruggedly handsome National Geographic photographer Robert Kincaid pulls into her driveway seeking directions. People might be familiar with “The Bridges of Madison County” via the book, the movie, the musical – or all three. 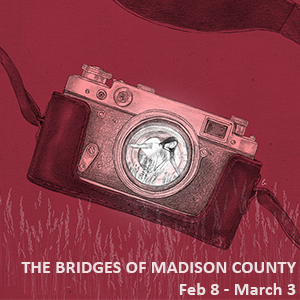 “The Bridges of Madison County” is running now through March 3 at the Suzanne Roberts Theatre. Ticket prices range from $20-$75. “Guys and Dolls” is one of the all-time classics of American musical theater. It features music and lyrics by Frank Loesser and book by Jo Swerling and Abe Burrows and is based on a pair of short stories by Damon Runyon. The hit musical opened on Broadway in 1950, ran for more than 1,200 performances and won five Tony Awards in 1951 — Best Musical, Best Performance by a Leading Actor in a Musical, Best Performance by a Featured Actress in a Musical, Best Choreography and Best Direction of a Musical. Runyon’s short stories, which were written in the 1920s and 1930s, featured gangsters, gamblers and other assorted unsavory characters from New York’s seedy underworld. Runyon was known for the unique dialect he employed in his stories — a mixture of highly formal language and slang. The show revolves around four main characters — Miss Adelaide, a veteran night club performer; Sky Masterson, a professional gambler addicted to his profession; Sergeant Sarah Brown, a prim and proper member of a Salvation Army style band; and Nathan Detroit, who runs an illegal floating crap game. One of the biggest reasons for the show’s continuing popularity is the music. The score is really good. Every single song in the show has become a standard. “Luck Be a Lady” still pops up on contemporary vocalists’ set lists. And, the characters are just as valid today as they were in the 1950s. The Candlelight Theatre’s production of “Guys and Dolls” is running now through February 24. Performances are Friday and Saturday evenings (doors 6 p.m./show, 8 p.m.) and Sunday afternoons (doors, 1 p.m./show, 3 p.m.). Tickets, which include dinner and show, are $63 for adults and $33 for children (ages 4-12). This weekend marks the final few days of Theatre Philadelphia’s Philly Theatre Week. The event features 81 organizations, 100 events and more than 300 performances now through February 17. This year’s Philly Theatre Week is supported by the National Endowment for the Arts. The festive celebration showcases the vibrant and diverse theatre scene in the tri-state region with the goal of making live theater even more accessible to the community. Participating organizations range from professional regional theaters to local community theaters, to self-producing artists, and everything in between. Events will include full performances, workshops, panels and more in Philadelphia and the Philly suburbs in Pennsylvania, New Jersey and Delaware. All tickets for participating shows are free, $15 or $30. 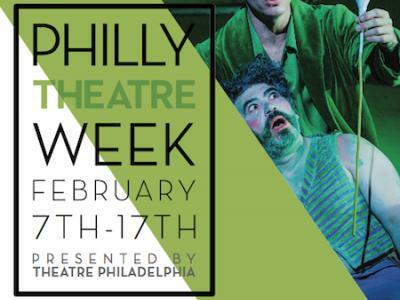 Philly Theatre Week tickets are officially on sale now at www.phillytheatreweek.org and through the TodayTix app. “We are proud to continue Philly Theatre Week as a new annual tradition in our region, celebrating the breadth and diversity of artists and organizations that make Philadelphia a vibrant hub for performing arts.” said Theatre Philadelphia Executive Director Leigh Goldenberg. For additional information, visit www.phillytheatreweek.com or call 267-761-9950. Should your entertainment tastes gravitate more to live music rather than live theater, there are also many good options this weekend including a Jazz Cocktail “Hour” with Paula Johns on February 15, a concert by The Devil Makes Three on February 14 and a show by Liily on February 15. The Uptown! 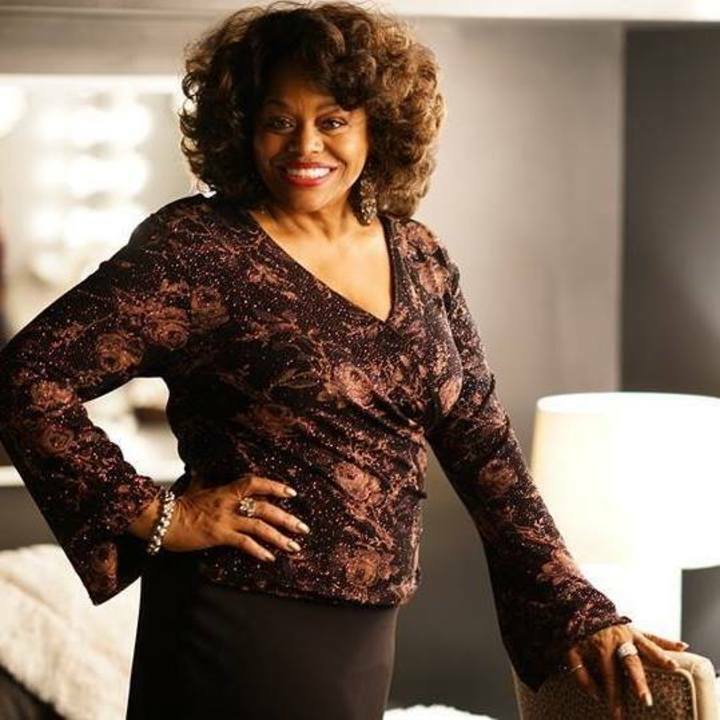 Knauer Performing Arts Center (236 North High Street, West Chester, https://uptownwestchester.org/) is hosting “Dueling Pianos” on February 14 (which is sold out) and “Jazz Cocktail Hour – Paula Johns presents ‘The Look of Love,’ A Tribute to Burt Bacharach & Dionne Warwick” on February 15. The Jazz Cocktail “Hour” begins with drinks and small bites. Concerts are held on the second floor of the Uptown! Knauer Performing Arts Center — The Univest Room. This intimate room allows the audience to experience the creative, improvisational form of jazz, up close and personal. Sara Michaels, jazz and blues vocalist and local resident, gives a brief introduction to connect the artist with the audience. In the show by Paula Johns, the audience will hear an array of Burt Bachrach compositions. Bachrach has written a slew of hits that worm their way into your brain after just a few listening. You can hear “Raindrops Keep Falling” at 10 a.m. and the song will still be popping up in your head at dinnertime. Johns will be performing Bachrach classics such as “Alfie,” “What the World Needs Now,” “Valley of the Dolls,” “The Look of Love,” “I Say A Little Prayer,” along with many other familiar and not so familiar songs. The Jazz Cocktail “Hour” will start at 7 p.m. on February 15. Tickets are $40 for adults and $25 for students. If you’re listening to an album or a concert by The Devil Makes Three and you hear a song in a genre that you’re not crazy about – hang in there. The next tune up will likely be in a completely different genre – most probably one more to your liking. The veteran Americana band, which will play at Union Transfer (1026 Spring Garden Street, Philadelphia, 215-232-2100, www.utphilly.com) on February 14, has a repertoire of songs that spans genres with ease – genres such as bluegrass, ragtime, folk, old-time, country, jazz, blues and rock. “Chains Are Broken,” which is the band’s first record of original songs since 2013’s “I’m a Stranger Here,” was released on August 24, 2018 via New West Records and debuted in the Top 10 Bluegrass Album Charts. 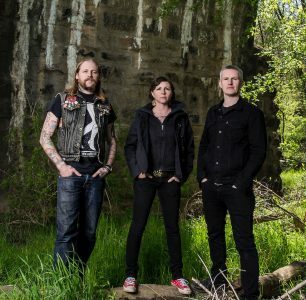 The Devil Makes Three is the core trio but often appears in augmented form with a drummer and a fiddle player joining the group in live shows. McBean and Bernhard are originally from the Brattleboro (Vermont) area where they played music together as childhood friends and when they were in high school. They were also acquainted with Turino, who was raised in Vermont, but didn’t know her well. After graduating from high school, all three moved to California separately. They became reacquainted in Santa Cruz, home of the University of California Santa Cruz “Fighting Banana Slugs.” Around 2010, Bernhard and Turino moved back to Brattleboro while McBean moved to Austin, Texas. “Our music has evolved a lot over the years,” said Bernhard. “It really has changed a lot. The biggest thing is that we’ve been growing and have become better musicians. And, we’ve become more collaborative. “We made the new album at Sonic Ranch Studios in El Paso, Texas with producer Ted Hutt. The studio is located on a huge pecan farm in the middle of nowhere. It’s an eerie experience. The place is really remote. The songs were deeper musically and lyrically. According to Bernhard, “I always want our songs to unfold like short stories. You could think of them like the chapters of a book. Of course, they’re shorter and maybe more poetic. This was a much more personal album about what it takes to be an artist or writer of any kind—and what you have to do to make your dream possible. All along, The Devil Makes Three has been more comfortable onstage than in the studio. Video link for The Devil Makes Three — https://youtu.be/8U8NhHQ5xz8. 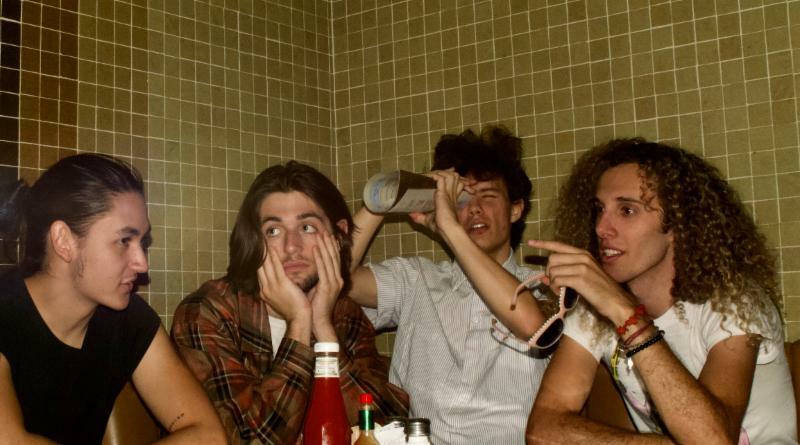 The show at Union Transfer, which has Lost Dog Street Band as the opener, will start at 8:30 p.m. Tickets are $30. Other upcoming shows at Union Transfer are Bob Mould Band and Titus Andronicus on February 15, Daughters, Wolf Eyes, and HIDE on February 16, and Jacob Banks and ABIR on February 20. Sherman Oaks will be “in the house” in Philly on February 15. In addition to opera singer/Sherman Oaks native Johnathan McCullough performing Friday at the Academy of Music, Liily, a rocking young quartet from Sherman Oaks, will be performing the same night at Johnny Brenda’s (1201 North Frankford Avenue, Philadelphia, 215-739-9684, www.johnnybrendas.com). Liily – Maxx Morando, drums; Sam De La Torre, guitar; Charlie Anastasis, bass; Dylan Nash, vocals — will be opening for The Glorious Sons at the popular venue in Fishtown. The Sepulveda Basin Wildlife Reserve is a recreation area in the Valley located between Sherman Oaks and Van Nuys. The single “Sepulveda Basin” follows the band’s two breakout tracks “Toro” and “Sold” from 2018, both which will appear on the foursome’s debut EP “I Can Fool Anybody In This Town.” The EP will be released on March 8 via Southern California-based indie label Flush Records. Liily has already received support from the rock community with radio-play on local favorites KCSN and KLOS, and big-time streaming activity with both “Sold” and “Toro.” The video for “Sold” premiered exclusively on Spotify’s “Rock This” and “New Noise” playlists and has gained nearly 400k views and over 1M streams. Anastasis said, “Originally, we were all in separate things. 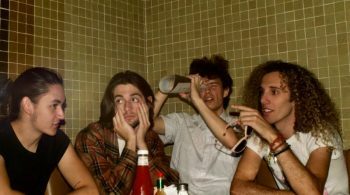 Me and Maxx played in other bands. It was hard to find like-minded individuals. “We all just met up at parties and just started jamming together. The next step was playing together. It evolved naturally. Moving up to a new plateau, Liily started playing shows at established clubs and began making records. “We have three singles and just released the third one about a month ago,” said Nash. “It’s called ‘Sepulveda Basin’ and it’s all about growing up in the Valley. Anastasis said, “Most of the making of the EP took place in Maxx’s home. He has a bunch of recording gear. And, me and Dylan did stuff on my computer that ended up on the EP. Now, we’re working on our first album – just doing it at Maxx’s house. Video link for Liily – https://youtu.be/BECUnls4QHA. The show at Johnny Brenda’s, which also features The Glorious Sons and JJ Wilde, will start at 8 p.m. Tickets are $18. Other upcoming shows at Johnny Brenda’s are Ecstatic Vision on February 14, Mo Lowda & The Humble on February 16, and Adia Victoria on February 20. Kennett Flash (102 Sycamore Alley, Kennett Square, 484-732-8295, http://www.kennettflash.org) will present Chuck Prophet & Stephanie Finch on February 14, “33 1/3 Live’s Killer Queen Experience” on February 15, Countdown To Ecstasy on February 16, and Open Mic with guest host Guenevere Calabrese on February 17. The Steel City Coffee House (203 Bridge Street, Phoenixville, 610-933-4043, www.steelcitycoffeehouse.com) will host ETC Theater Company’s “Love Stinks” on February 14 and Jeffrey Gaines on February 16. Chaplin’s (66 North Main Street, Spring City, 610-792-4110, http://chaplinslive.com) will have Underwater Robots, Ed Matthews, Jake Currie and Rob Levy on February 15 and Duncan, Wormtooth, Koresh and Sans Blix on February 16. The Ardmore Music Hall (23 East Lancaster Avenue, Ardmore, 610-649-8389, www.ardmoremusic.com) will present Patrizio Buanne with special guest Remember Jones Duo on February 14, Splintered Sunlight / Wax Future on February 15, Sarah Shook & the Disarmers, National Reserve with special guest Hannah Taylor & Rekardo Lee on February 16, and Bill Frisell on February 17. Burlap & Bean Coffeehouse (204 South Newtown Street Road, Newtown Square, 484-427-4547, www.burlapandbean.com) will present Craig Bickhardt and Andrea Carlson on February 16. The Keswick Theater (291 N. Keswick Avenue, Glenside, 215-572-7650, www.keswicktheatre.com) presents “Who’s Bad” on February 15, Neal Morse Band on February 16 and Jack Hanna on February 17. The Sellersville Theater (24 West Temple Avenue, Sellersville, 215-257-5808, www.st94.com) will host Kick It Out (Heart Tribute) on February 14, Vanessa Collier on February 15, Martin Sexton on February 16, Roger Kabler’s “Robin, the Ultimate Robin Williams Tribute Experience” & Over Actor’s Anonymous on February 17, and The Spring on February 20. The Locks at Sona (4417 Main Street, Manayunk, 484- 273-0481, sonapub.com) will host Brian Seymour, Andrea Nardello, Lauren Hart on February 14, Jared Feinman with special guest HANN on February 15, Andy McKee with special guest Dave Bakey on February 16, and Rachael Yamagata with special guest Zach Djanikian on February 17. Rrazz Room (6426 Lower York Road, New Hope, 888-596-1027, www.TheRrazzRoom.com) presents Kathy Graham “A Time For Love” featuring Bob Egan, Music Director.